Physicists in a Korea-Japan collaboration have devised a way to make hard walls transmit sound almost perfectly, which could prove useful for developing new types of windows or acoustic concentrators. Based on solid walls of metal or plastic perforated by small holes containing stretched membranes made of humble kitchen cling film, the collaboration have imaged sound travelling unimpeded through them. Sound in such structures, known as metamaterials, resonates strongly with the structure at certain frequencies, allowing counterintuitive effects such as zero sonic reflection. This is an example of a phenomenon known as extraordinary transmission, first demonstrated in the field of optics, whereby light waves are squeezed through sub-wavelength holes more efficiently than expected [2,3]. In the design presented, a tiny force from the sound wave is sufficient to launch a large motion of the membranes, a situation that mimics the air in the hole moving as if with zero mass. Sam Lee of Yonsei University, Kong-ju Bok Lee of Ehwa Women’s University and Oliver Wright of Hokkaido University speculate that this sonic invisible wall could be used for security glass, for example in banks or taxis, that allows you to talk across it, but protects you from any mechanical intrusion. 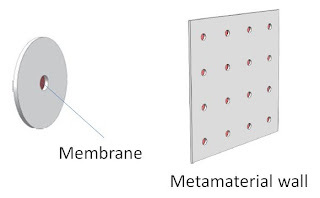 Figure 1: (left) Single hole with membrane in a cylindrical duct; (right) metamaterial wall consisting of an array of holes containing membranes. In the first experiments done, sound was incident in a cylindrical tube of diameter 100 mm on a wall blocking the tube containing a single hole of diameter 17 mm mounted with a tight membrane, as shown in Figure 1. It was found that 90% of the acoustic amplitude was transmitted at the audio frequency of 1.2 kHz, in spite of only 3% of the area of the wall being open. The team also demonstrated a giant concentration up to a factor of 5700 with smaller holes, and that the acoustic energy is effectively transmitted for any angle of incidence, as shown in the example of Figure 2. Figure 1 also shows an example of how a wall of membrane-covered holes could be constructed, effectively constituting a metamaterial wall that transmits sound effectively. This “extraordinary-transmission” phenomenon can be used over a wide range of frequencies. So the method would work equally well for ultrasound, for which preliminary experiments have been reported at lower efficiencies using resonances in bare holes ; this could be exploited to concentrate ultrasonic energy through tiny holes, forming novel lenses useful for high resolution ultrasonic imaging. Figure 2: (Bottom image) Pressure map obtained in the audio-frequency extraordinary-acoustic transmission experiment at 1.2 kHz on an acoustic metamaterial consisting of tight membranes in 4 tiny holes, showing a giant acoustic concentration of 5700 in intensity with an areal coverage ratio of only 0.03. (Top image) Image for holes with no membranes. Jong Jin Park, K. J. 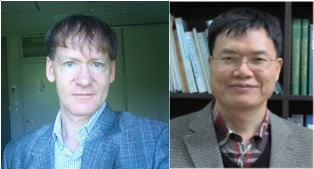 B. Lee, Oliver B. Wright, Myoung Ki Jung, and Sam H. Lee, "Giant Acoustic Concentration by Extraordinary Transmission in Zero-Mass Metamaterials", Physical Review Letters, 110, 244302 (2013). Abstract. R. Ulrich, in Optical and Acoustical Microelectronics, edited by J. Fox, page 359 (Polytechnic, New York, 1974). T.W. Ebbesen, H. J. Lezec, H. F. Ghaemi, T. Thio and P. A. Wolff, "Extraordinary optical transmission through sub-wavelength hole arrays", Nature, 391, 667 (1998). Abstract. Bo Hou, Jun Mei, Manzhu Ke, Weijia Wen, Zhengyou Liu, Jing Shi, and Ping Sheng, "Tuning Fabry-Perot resonances via diffraction evanescent waves", Physical Review B, 76, 054303 (2007). Abstract.